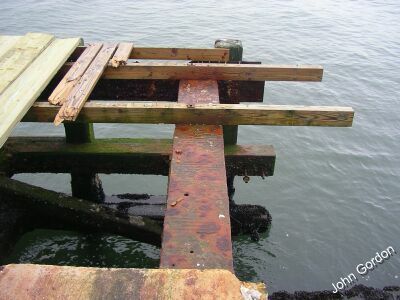 The metal foundation for the landing dock at Harbor of Refuge -- sans deck -- awaits spring repairs. Volunteers had to put down a half dozen planks to provide an access route to the lighthouse. Spring had barely sprung when DRBLHF volunteers were in the launch and out to the lighthouses to see how Ole Man Winter had treated them . Under the leadership of Work Party Chair John Gordon and Board Member Red Moulinier, volunteers assessed and measured and inventoried and planned how to right the wrongs of winter. Because of the relatively mild winter, damage at both lighthouses was mild, except for the deck at Harbor. 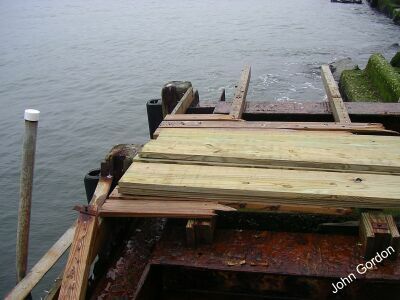 The deck was fatally damaged by Tropical Storm Ernesto last fall, then finished off by winter storms. The lower deck is completely gone; the upper deck is missing about 20% of its planks. Work will get under way in April. In addition to replacing the deck, volunteers will give the two lights a spring cleaning and make other minor repairs. If you'd like to volunteer, phone 302-644-7046 and leave a message for John.